For the past few weeks, I have been deep into research/writing mode, which admittedly isn’t out of the ordinary. We were asked by a local Scout troop to lead a Union Cemetery tour, focusing on soldiers in honour of Remembrance Day. We talk about the Veteran’s plots in general on many of our tours, but we did not have one looking at specific individuals. Speaking with the leader, I became excited about the possibilities of this tour and about filling in a gap with our current program offerings. So I turned to the archives and various online databases, and I began my research. There are two Veteran’s Plots in Oshawa’s Union Cemetery: World War I and World War II. Looking at the stones and learning more about these brave men and women was truly fascinating, that I could have written this post about any one of them. There was Ernest Bush, who in WWII fought with the Princess Pats, married an English woman while stationed overseas, but succumbed to military Tuberculosis upon his return home. There is also the mystery of Nursing Sister Hayes, for whom we need to do more research to learn more about this brave woman who enlisted and helped the wounded. Of course, we have the story of Private William Garrow, who enlisted for WWI and was killed in action less than 10 months later. He was 22 years old. For some soldiers, there was little information available, but for the more prolific, like Albert Hind, we were able to learn quite a bit about him. 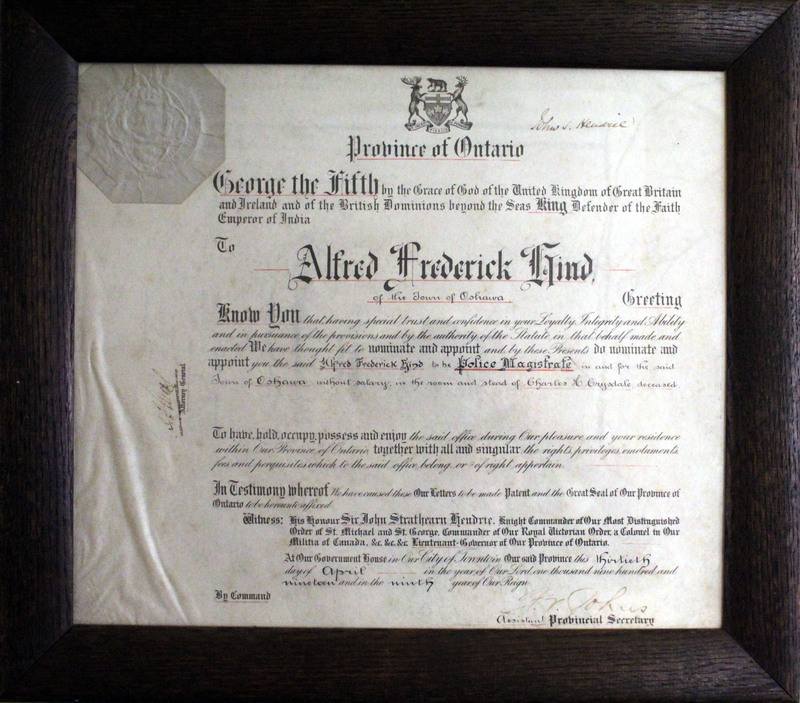 Albert Frederick Hind was born in England in 1877, and came to Canada in 1907. He was a police chief constable for the Town of Oshawa at the time of the outbreak of World War I. 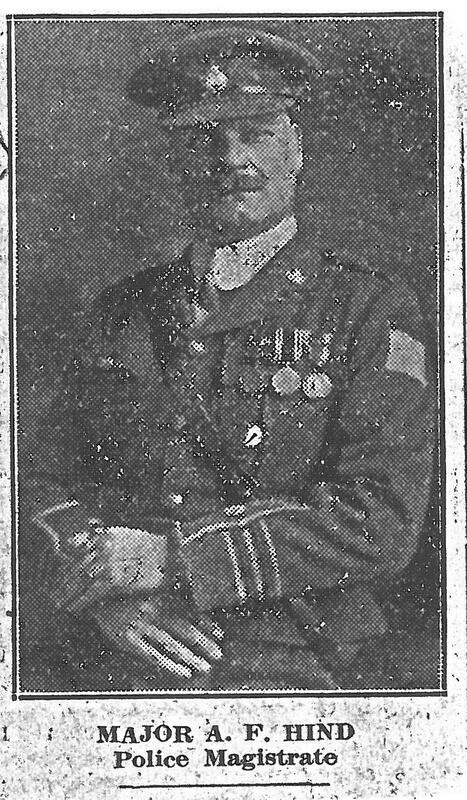 He earned the rank of Major with D Company of the 34th Regiment, and would serve overseas with the Canadian Expeditionary Force. Upon returning from the war, he was promoted to Police Magistrate, a position he would hold until his death. He passed away at age 53 in 1930. His cause of death, heart inflammation, was attributed to his service during WWI; the maple leaf on his headstone is indicative of this. His funeral was at his house on Simcoe Street in Oshawa, and he was buried in Union with full military honours. The regiment paraded from the Armouries on Simcoe Street to the cemetery, and three traditional volleys of the gun were fired at the graveside. 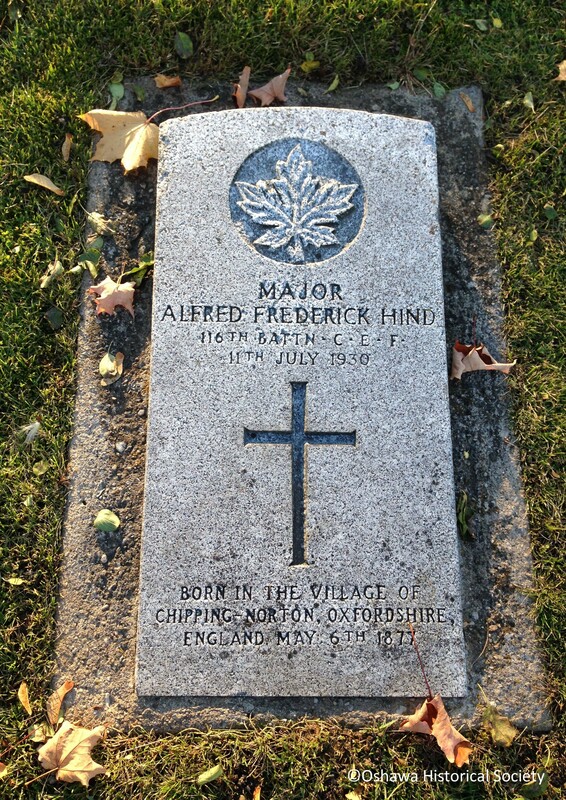 Hind was only one of many men and women from Oshawa who fought for Canada. We owe a debt of gratitude to those who came before us and those who still see action in combat. On November 11, we will pause and remember. Lest we forget. This entry was posted in Around Oshawa, From The Archives, Museum Events and tagged Archives, Cemetery, Heritage, Historical, History, Local History, Museum, Oshawa, Oshawa Community Archives, Oshawa Community Museum, Remembrance, Remembrance Day, Soldiers, Union Cemetery, War, WWI, WWII by oshawahistoricalsociety. Bookmark the permalink.